If you are coming to Barcelona you have to witness the city’s festivals first-hand to fully grasp why the Catalan capital is known for throwing some of the most vibrant and exciting fiestas in Europe! The people of Catalonia celebrate many things from religious holidays to neighborhood competitions, all of which include some wonderful, although perhaps slightly strange, rituals and traditions. From scorching fire-runs to human towers that reach up to 8 stories high, those visiting Gaudí’s city are sure to be intrigued, and even inspired, by the colorful Catalan customs awaiting them at Barcelona’s festivals! For an experience sure to get your heart pumping, head for the most anticipated event during the annual Festes de la Mercè: the Correfoc! This ‘fire-run’ consists of dragons, devils and numerous variations of the ‘bestiari de foc’ (fire beasts) who perform dances and parades while sparks fly as the sky lights up with an estimated 80,000 fireworks! Rest assured, if you can’t make the Festes de la Mercè, this sizzling parade can be seen at plenty of the other festivals in Barcelona during the year. 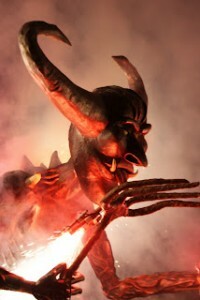 Where to see it: You’ll find the Correfoc at many festivals and events in Barcelona, but the biggest is the Correfoc on Via Laietana at the Festes de la Mercè in September each year. The flashy and fabulous style of the Flamenco is one that is renowned the world over, but Barcelona offers an enticing alternative: the Sardana! 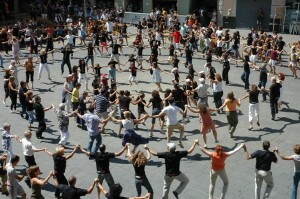 The official dance of Catalonia is best described as dancers joining hands with raised arms, forming circles which grow bigger and bigger as more people join in. An exceptionally disciplined dance, a leader in each circle provides the exact movements and precise timing. The Cobla (an 11-person band with woodwind, brass and drum players) provides the background music for this traditional bop. 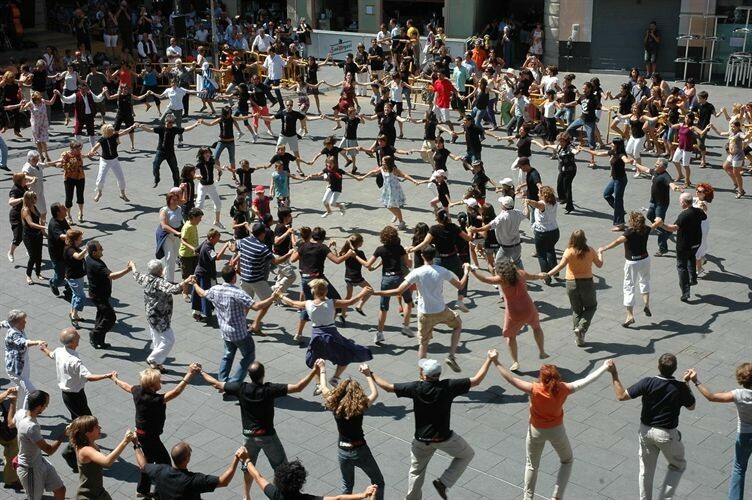 Where to see it: This dance can be seen at religious festivals and day-long gatherings, as well as every Saturday outside of the Barcelona Cathedral during the summer months. This is one of the Catalan capital’s most breathtaking and dangerous traditions. 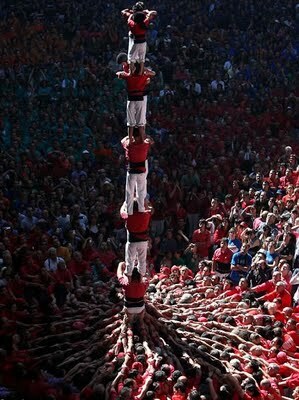 The Castellers are troupes that build human towers up to 8 stories tall, leaving spectators holding their breaths and anxiously hoping that no one falls. The levels are built as the team carefully climbs up one another, with the Pom de Dalt (the Tower Dome) at the highest point. Here a small child must cross the top of the structure and quickly slide back down the other side. Nail-biting stuff! Where to see it: All Barcelona festivals, as well as the morning of Catalonia’s National Day (September 11th), normally at the Monument a Rafael de Casanova. 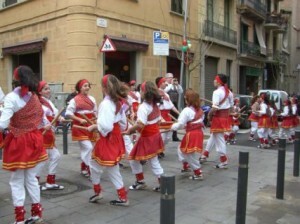 Another unique Catalan custom, known as the Ball de Bastons, sees a group of individuals dancing while stick fighting! Dating back to 1150, this is one of Catalonia’s oldest traditions. The dancers, called Bastoners, line up in two opposing rows, clashing sticks with each other. Sit back and enjoy this mesmerizing Catalan custom, while a tabor pipe, shawm or bagpipe provides the musical backdrop for this unusual jive! 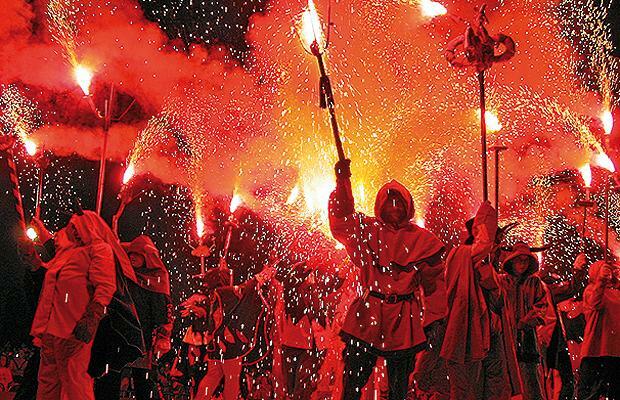 Where to see it: All traditional Catalan festivals. 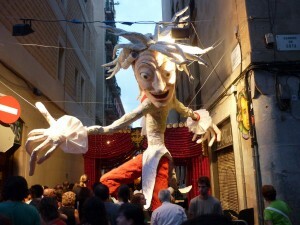 Be sure to catch them in action at the Festa Major de Sants every August. No Barcelona festival would be complete without these oversized, colorful and imaginative papier-mâche figures dancing down the streets! Gegants and Capgrossos (giants and big heads) are as much a part of Barcelona as Gaudí’s designs are. Each neighborhood is represented by a different vivacious character and these entertaining figures usually appear as part of the opening act to any festival in Barcelona. Where to see it: La Mercè festival every September, as well as smaller neighborhood parties like the Festa Major de Gràcia each August. Want to see some of these colorful customs up-close? Choose one of the many apartments in Barcelona near the city center or in the Gothic District of the city and you will be sure to catch at least one of these quirky traditions during your stay. Who knows, you may even find your balcony gives you the best vantage point to experience the shows! This entry was posted in Activities, Events and tagged Barcelona culture, barcelona events, barcelona festivals, barcelona festivals and celebrations, barcelona tourist guide, barcelona traditions, catalan culture, catalan customs, travelling around barcelona, visiting barcelona. Bookmark the permalink.